Your body can’t produce BCAAs on its own, so you need to get them from your food or supplements. BCAAs are metabolized primarily in the skeletal muscle, unlike most amino acids that are metabolized in the liver. This means they are more readily available to the body as fuel. They are absolutely essential for building and repairing muscle and can help with weight loss. For people who are looking to lose weight without sacrificing muscle, BCAAs can be a vital supplement. Calorie restriction can also result in catabolism, where the body begins to break down lean muscle as a source of energy. Supplementing with BCAAs can help reduce this unwanted muscle breakdown. The BCAA in the whey protein takes some time to be digested, broken down and separated from the whey and everything else in it and that means it takes a while for the body to obtain the BCAAs. 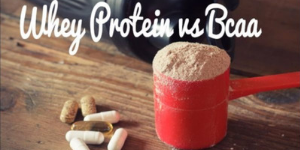 Protein powder with a high amount of whey hydrolysates is better absorbed by the body. Whey hydrolysates go through an extra process to create smaller peptide chains, so they are more easily absorbed and digested by the body. Easy digestion also leads to faster nutrient absorption. BCAAs and protein are equally essential in daily nutrition and supplement regimen. It’s all about the need for speed. Think of it this way: BCAAs are the building blocks of protein, so if you take protein, your body has to break down the protein to use the BCAAs. Taking straight BCAAs, on the other hand, skips that step. Your body can use the BCAAs immediately. You still should take protein to help build muscle and strength, but make sure you are taking BCAAs as well.